Full Sail's main brewery is in Hood River but they also operate a small brewhouse on Portland's southwest waterfront. Situated within McCormick & Schmick's, they brew small batches with a 24-barrel brew kettle. Their fermenters can accommodate a double batch and their output is approximately 3,000 barrels/year, far less than the 100,000+ barrels the main brewery produces. Brewer Phil Roche, who created Phil's Existential Alt for Full Sail's Brewer's Share series, makes the most of the small brewing space. The entire operation can be seen by standing in one place and when it's time to fill kegs and bottles, every piece of equipment and the supplies are carefully laid out with the finished products temporarily being stacked on the sidewalk outside. The coolest piece of equipment however is their tipping mash tun, which I'm told is the only one in the U.S. Even empty, it's pretty impressive and worth a minute to watch. In addition to touring the brewery Phil also provided samples of three of their beers: Cascade Pilsner, Chris's Summer Delight Berliner Weiss and Session Black. I have to admit that I don't drink much Full Sail but after tasting these three, I'll be rethinking that. The pilsner was delightfully hop heavy with 54 IBUs, the Berliner Weiss a very approachable example of the style and the Session Black roasty yet clean and drinkable in the way one would expect a lager to be. Tours of the brewery aren't generally available but you might be able to get a peek from above if you happen to visit McCormick & Schmick's on a Tuesday or Wednesday (the days Phil is most likely brewing). Nearly half of their taps are Full Sail products so short of visiting Hood River, this is the best place in town to sample a wide range of Full Sail beers (six-beer samplers are available). Who knows, even if you've had Full Sail beers in the past, you may find like I did, a new appreciation for them. The new event space above and part of Bailey's Taproom, The Upper Lip, hosted Oakshire Brewmaster Matt Van Wyk for a seminar that was touted to pour Hellshire III, 2012 Very Ill Tempered Gnome, 12 Proof and Biere de Mars. We were treated to a walkthrough of not only those four beers but an additional four - Hellshire I and II, 6th Anniversary and Funk the Farmhouse - and the opportunity to buy three-bottle sets of Hellshire I, II and III. For those who follow Oakshire's beer, you might recall that there was "an issue" with Hellshire II, which led Oakshire to do a voluntary recall. Matt described that the base beer, an imperial stout, "wasn't fantastic" before it went into the bourbon barrels. Attempting to improve the end product a variety of things were added including vanilla beans, oak spires and coffee. Somewhere along the way some lactobacillus made its way into at least some of the bottles, souring it and prompting the recall. While I agree something might be a bit "off" with this beer, I enjoy sours and found this to be my favorite of the eight beers we tasted. Second runner up for me was their 6th Anniversary beer, a barleywine aged in brandy barrels. It had a trifecta of aroma, mouthfeel and flavor that made me wish they were selling bottles of this. Their 7th Anniversary beer will be released in October and "may" be a sour cherry Baltic porter. Or not. Taking the bronze was their Funk the Farmhouse, a variation of the beer they made for NAOBF, Save the Farmhouse. Bottled only nine days ago it already has a beautiful sour aroma and light, tart flavor. It is a bit thin but there is definitely potential. I've had very few of Oakshire's barrel-aged or specialty beers (I'm a sucker for O'Dark:30 and Overcast Espresso Stout) so even though I didn't love all of the beers we tasted it was a great experience. I'm always up for trying something new to me and getting to hear about what went into the creation of each beer from the brewmaster takes it to the next level. Thanks to Matt, Adam and Bailey's for a great seminar! For the first day of the 2013 Oregon Brewers Festival Portland put on its summer best - clear blue skies, warm temps and a refreshing breeze coming off the water. 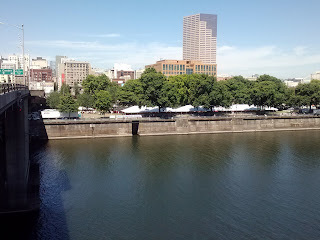 From atop the Morrison bridge the bright white festival tents beckoned. 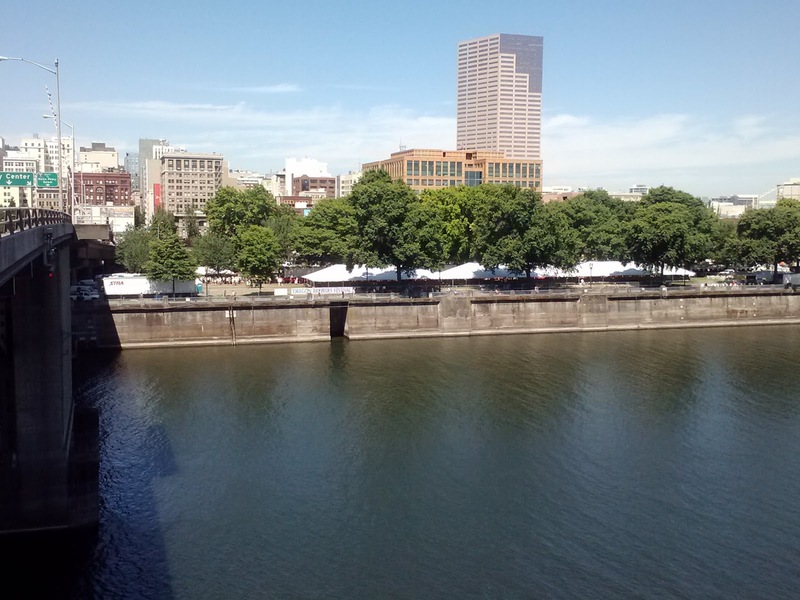 In typical festival fashion, I arrived shortly before the gates opened and found a short line at the south entrance waiting in the cool shadows under the Morrison bridge. As I made my way to the middle of the festival grounds to get my glass and tokens the tail end of the parade was making its way in. I had time to grab my first sample before the official toast and subsequent tapping of the complimentary Blueberry Belgian from BridgePort. Boulder Beer Co Pump Up the Jam - Not as visually appealing as many fruit beers, there was a great berry/jam aroma, a surprising mouthfeel similar to drinking apricot juice and a flavor that was pleasantly fruity without being too sweet. West Highland Brewing Mango Moon Ale - Have you ever had those peach rings candies? You know the gummy ones? This beer smelled like a mango version of that and followed with a fruity flavor that was slightly tart and overall very good. I don't know if I've had a mango beer or anything from West Highland before but this first experience with both was very good. Old Market Pub & Brewery Dilution of Grandeur - While I've been to Old Market once, and with a huge sampler tray their beers were all over the board for me, their version of a berry Belgian lambic turned out quite well. Not as tart as some lambics but one of the better beers I've had from them for sure. I didn't quite get through my whole list but there's still four more days of the festival. Perhaps I'll make it back for another round of drinking and chatting with friends. Perhaps I'll run into you and we'll talk about some of your favorites (or feel free to leave them in the comments). My last attempt at a beer and dessert pairing was with four kinds of Girl Scout cookies that spanned from really good to mediocre. Beyond that I've pretty much left it to the experts putting together beer dinners to present me with something that works well together. Last night I wound up with a completely unplanned pairing. This is how it went down. A buddy and I went to Bar Bar and I tried to order some Corn Nuts to go with my beer but they were out. Bummed, I glanced back at their brief wall menu and the item directly below Corn Nuts was "brownie." What came out was not just a standard sized square brownie, but one that was probably a fourth of an 8x8 pan. 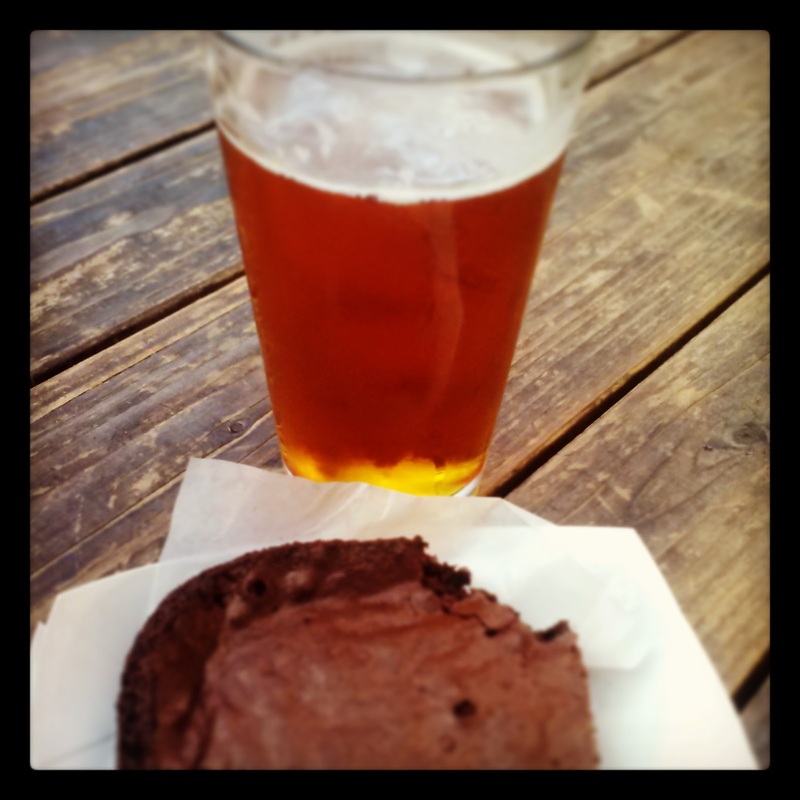 The brownie was moist and delicious on its own but what really surprised me was how well it went with my pint of Lagunitas IPA. It was a random, delicious stroke of luck that I probably couldn't have done better had I planned it. 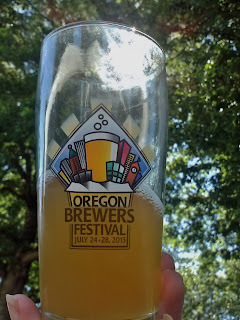 Last week I talked about my beer festival must-haves and now it's time to talk about The Portland Beer Festival. Yes, it's none other than the Oregon Brewers Festival, the big kahuna lounging along the Willamette at Tom McCall Waterfront Park in Portland. Now in its 26th year, the festival has expanded to a five-day event. As in past years the festival kicks off with the Oregon Brewers Brunch (which if you haven't gotten tickets for yet, you're SOL) and parade. Three things are notably different however. First, the festival now starts on Wednesday instead of Thursday. 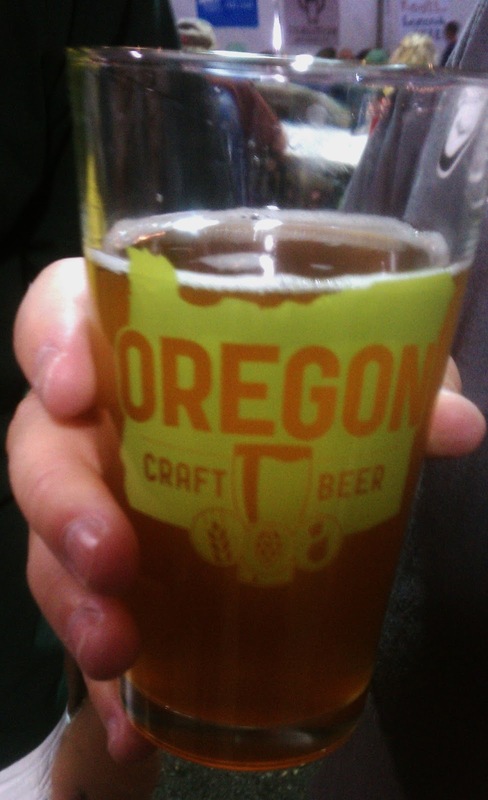 Second, no longer will attendees be subjected to drinking great beer out of plastic mugs. 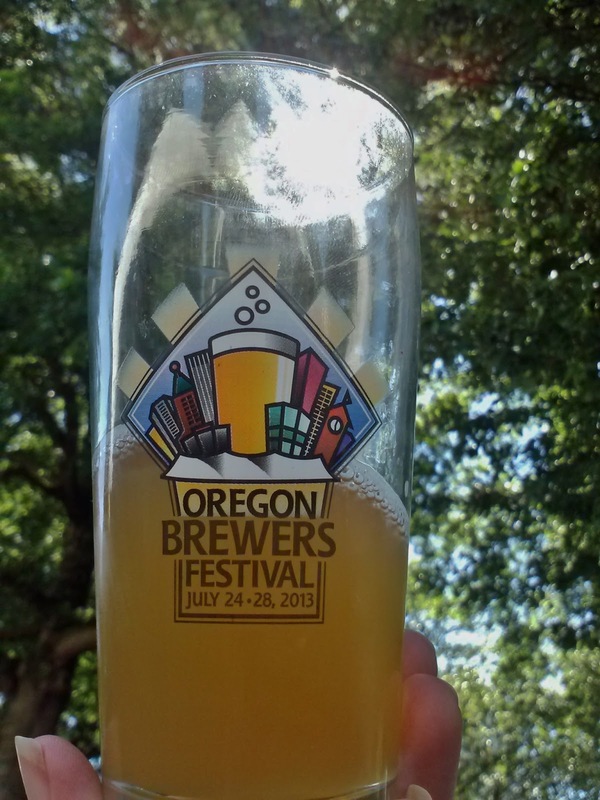 This year the festival glasses will actually be glass, 12.8 oz vessels. Third, there will not be the Buzz Tent or the Sour Tent that the festival has seen in the past few years. I'm on the fence about this change - there were some great beers poured out of both tents but there were also plenty of problems associated with them including the high cost of the beers (some that were worth it, others that were not) and getting the information out about keg turnover. 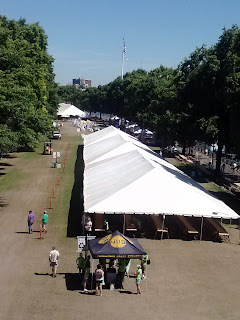 Hopefully a year off from these tents will allow festival organizers to come back with new and improved versions. The beer however is the star and after a perusal of the beer line up, I managed to narrow down the impressive list of 80+ beers to a short list of 20. Many of them are fruit beers, which seems to be a trend for me lately. The rest are interesting sounding beers of styles I don't usually drink and a festival is the perfect place to give them a try. See you there! 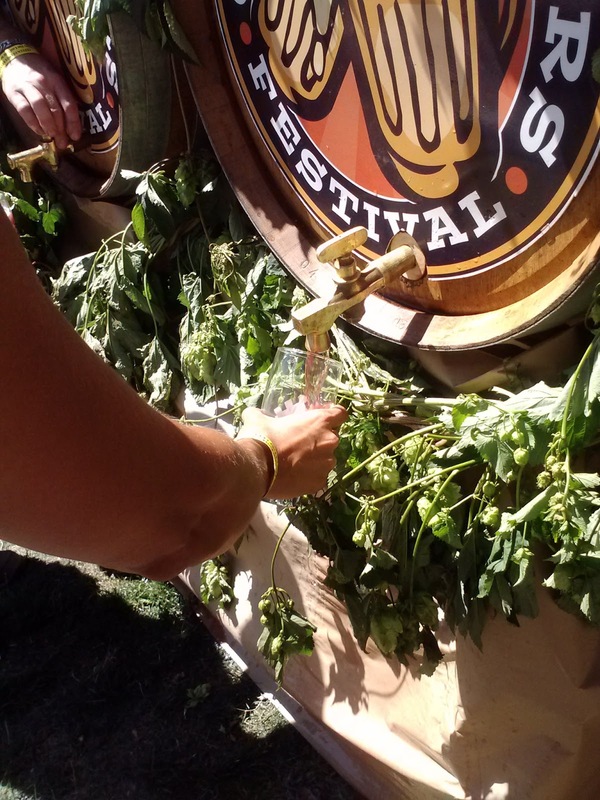 Beer festival season is in full swing across the country. A veteran of many festivals, I've found some to be more restrictive than others about what attendees are allowed to bring in. The best ones have no restrictions on my two festival must-haves: water and food. More and more festivals are getting wise to the fact that when drinking beer one should also make sure to drink plenty of water. To that end more are allowing water bottles to be brought in and/or having plenty of water stations planted throughout the festival area. Either is fine with me as long as I have easy access to plenty of water. Not only is remaining hydrated important but so is keeping my glass free of any residual flavors or aromas from the last sample. Pro tip: drink your rinse water. Festivals that also allow food to be brought in get huge points from me. Most won't make people remove pretzel necklaces but it's the heartier, easy-to-nibble-on foods I prefer like meat, cheese and nuts. I've found those foods have some staying power and help offset the alcohol intake. When combined with enough water they make for a much more pleasant post-festival experience. I'm aware that I'm a little obsessive about carrying my own food and water. Many people are fine rolling with the punches and being content with whatever is available. Do you take your own food and/or water to festivals when it's allowed? If so, what are your preferred snacks or water vessel (bottle, Camelback, etc.) 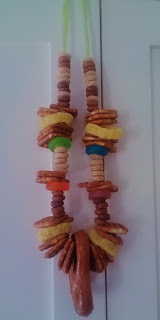 for beer festing? Thanks to one of the many beer related emails that hit my inboxes daily, I found out that this year's winner of the AHA title "Homebrewer of the Year" is a woman. I also found out that Annie Johnson is the first woman to claim that title in 30 years. Not only that, her entry was a light lager. First of all, congrats to Annie! Sitting at the top of the heap of 3,400 entries is pretty darn cool and something she's likely put years and years into achieving. Second, I think the fact that a light lager was able to win the competition speaks to growing popularity of lower alcohol, lighter beers. I have friends who have gotten tired of super-hopped beers and who are looking for well-made, sessionable counterparts to the IPAs/DIPAs/Imperial IPAs that I love. 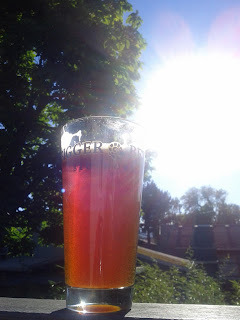 There is, of course, also the argument to be made that making a quality light beer takes much more finesse than dumping in as many hops as one can, letting them and a higher alcohol content gloss over imperfections. Third, and this is a point that I hope I am able to phrase appropriately, I would be remiss in my thoughts on this brewer if I didn't also include the fact that Annie is black. For years Mag and I have commented on the very noticeable lack of non-white people at beer festivals. It seems to extend to the brewing industry in general as well. I find it odd and wonder why that's the case. If you have any theories or if you're a non-white craft beer drinker or brewer I'd love to hear what you think. Have a great 4th everyone and whether you reach for a sessionable lager, a pucker-inducing sour or a steroid-hopped brew, enjoy!